gfire's "Women to Watch" - Sat. March 19, 2016 - a career highlight!! 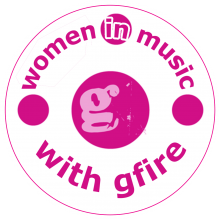 SXSW 2016 is over - but the gfire's "Women to Watch" music series hit a new career highlight for gfire and her female-centric showcase. Seven acts featuring all original music and at least one woman in each band performed at the upscale Opa! Coffee House & Wine Bar on 2050 S. Lamar Blvd in Austin, Texas. Bands included "The Dumplings," a Polish EDM duo, Rosie Carney, Irish singer/songwriter, Austin U18 favorites, "Annie & Kate," the Swedish/Belgium experimental duo "Victoria+Jean," folk local heroine Laura Lee Imhoff, newbie Susanna Lee on keyboards & vocals, and, of course, gfire herself performing her latest "folk-tronica" compositions.